There is only one week left to view the March exhibition; Rare Earth 2012. This is an invitational clay show that features the works of 7 talented potters. 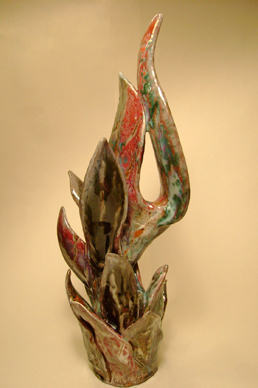 The work includes both functional and non-functional aspects of contemporary clay work. The artists included in the exhibition are: Maria Andrade, Asheville, North Carolina, Kevin Cook, Rockledge, Florida, Martin Cushman, Mt. Plymouth, Florida, Vadim Malkin, Orlando, Florida, Katherine Mathisen, Ocoee, Florida, Kellie Moore, Chuluota, Florida Aletha Rector, Melbourne, Florida. The Fifth Avenue Art Gallery is located in EGAD, the Eau Gallie Arts District of Melbourne, across the street from the Foosaner Art Museum. Gallery telephone number is 321 259-8261. Visit us online: www.fifthavenueartgallery.com and on Facebook.